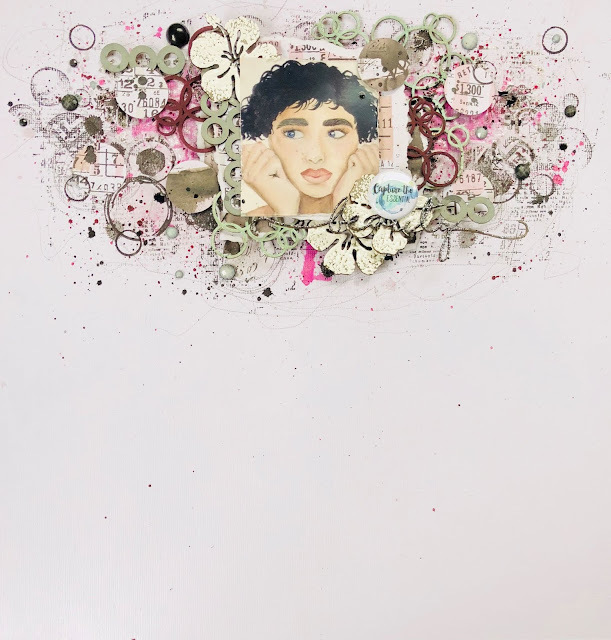 2 Crafty Chipboard : Beauty - layout and bonus video by Emma. Beauty - layout and bonus video by Emma. She inspires me and is creating some cool art. I really loved it and felt inspired to create with it. I used some cool chipboard for it and really felt I wanted to play with a circle theme. I also chose to use a colour tone that isn’t my go to but wanted to try something different for me. Again I drew inspo from the image and this time her lips. So I chose a lindys starburst spray in magnolia magenta gold. And so for a couple of the bubble clumps I purely just painted them, and painted them in a colour tone to fit my page and compliment the base colour, I used a Dylusions acrylic in pomegranate seed. And for the other bubble clumps and the dotty bits I coated in an oxide ink but this time a muted tone using iced spruce. The gorgeous hibiscus flowers I embossed with a chunky white emboss powder, I really wanted them to not be ‘perfect’, so this is why I chose the chunky emboss, as it heats up it seperates and you can see through it. And finally for my title piece I again simply embossed with a novo powder. I love this black shimmer it really makes the title stand out. I really hope this has inspired you in some way. I have a little video for this one too, I would love you to check out and hopefully inspire just a little more. I’ll catch you all next month. Gorgeous layout and great video!! Very beautiful layout Emma. Off to watch the video. J'aime beaucoup votre style !! !